Stikkan is a cast iron hand tool invented in Norway in 1982 and now manufactured by us, in Sweden. 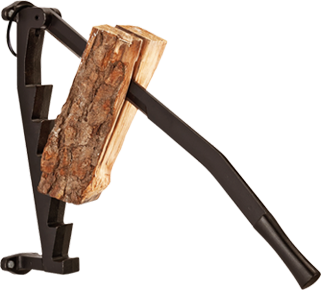 Fixed to a wall beside a wood stove, fireplace or in a wood shed, Stikkan is used to make kindling easily and safely. Flamman is a smart Scandinavian designed blowpipe and poker which is scientifically developed boosting a diminshing fire and replacing your bellow and poker. It makes the air come out as a jet beam which you can direct on the glow and thereby the ash do not fly around in or outside your fireplace. ​With Flamman you can easily poke in your fire and remove the ash, i.e. sell your existing fire tools. The story of Stikkan started in the early 1980´s. The inventor Tormod Lie, who was a successful international traveling engineer, came home and his wife complained that it had been difficult to get their stove going. When the inventor Tormod Lie, who was a successful engineer, traveling internationally, came home his wife complained it had been difficult to get their stove going. The winters can be very cold in the Norwegian mountains and the good engineer spent a lot of time solving the problem of how to make kindling easy and safe without using a dangerous axe. In 1982 he was rewarded with design patent by the Norwegian Industrial Property Office (NIPO) for Stikkan. Stikkan is now manufactured by ourselves in Forshaga, Sweden and is successfully sold in 20 countries, for example New Zealand, North America, Russia and Europe.